Our ten-year old son made this video for us. We're rather proud! 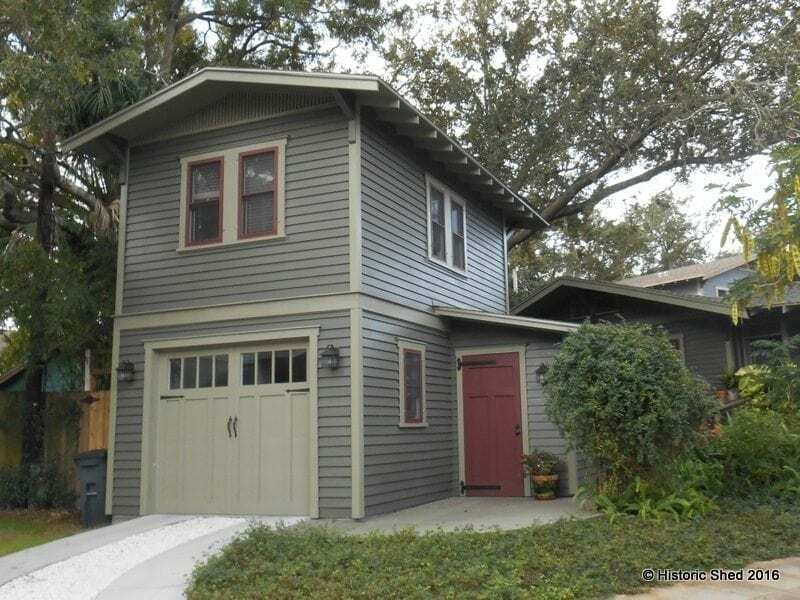 Historic Shed was recently contacted by a resident in the Palma Ceia neighborhood in Tampa about a historic garage on their property. They were thinking about listing the darling Mission-style bungalow for sale, but were concerned that the old garage was not an asset to the property. It was useful, but not attractive due to multiple alterations; the wide doors had been replaced with a metal door and window, the driveway removed, and the entire roof reframed (we speculate that it was originally a flat roofed garage with parapets that matched the main house). We determined that the easiest solution to giving the building some historic character again was to install a new pair of carriage house-style doors made of cypress bead-board with a period-inspired design. Since the garage was too narrow to fit a modern car, and to improve the structural strength, we made the doors a bit narrower than the originals would have been. The old garage now complements the main house again and nestles nicely into the landscape. While definitions of what constitutes a bungalow home vary, the common ingredients generally include one to one-and-a-half stories, a full or nearly full-width front porch, and a low slope roof. Examples can exhibit a variety of architectural styles including Craftsman, Mission and vernacular. We have designed sheds to complement a variety of bungalow homes, most with Craftsman detailing such as eave brackets and exposed rafter tails. 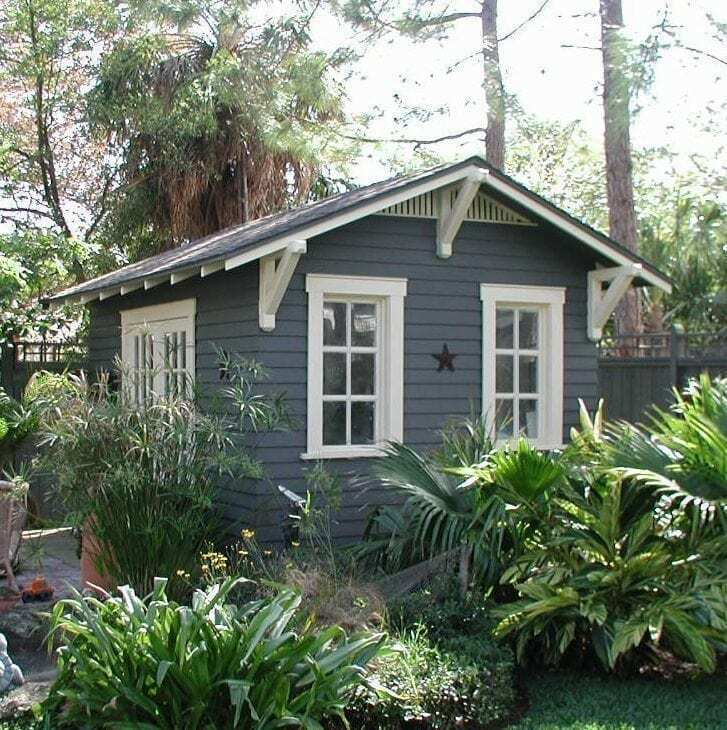 One of our earliest Historic Shed designs complemented a 1923 Craftsman bungalow within the historic Hyde Park neighborhood in Tampa. The bungalow featured a cross-gable roof with a small front gable vent dormer, a full width integral front porch with brick piers and round spool columns, integral carport, exposed rafter tails and eave brackets. We fully renovated the house, inside and out, including reopening the front porch that had been enclosed with jalousie windows and installing a period-inspired breakfast nook. Bungalow "Before" Bungalow "After" New Breakfast Nook As the renovations came to a close, the room that had been designated a home office was reallocated as a nursery for a second child. To replace the lost office space, we built a 10'x14' shed in the rear yard to complement the main house, complete with finished interior, electrical service, internet, cable TV and a wall unit AC. The new shed was designed and built with the same roof slope, gable end vents, exposed rafter tails, eave brackets, siding, etc. as the main house. The interior had wood flooring, beadboard-covered raised ceiling and board and batten interior walls. Because of site constraints, the shed was site-built. Framing the home office Historic Shed on site The home office shed nestled into the landscaping The shed is accessed via a bridge over a koi pond and has a reclaimed brick patio - not a bad commute! Historic Shed has teamed up with the historic Hyde Park Neighborhood to display a custom shed as part of their annual Home Tour. On March 7, the neighborhood will once again open the doors of some of its finest historic homes to the public, raising funds for neighborhood improvements and showcasing some great historic architecture.Eight homes are on this year's walking tour, featuring rehabilitated historic bungalows along with examples of new home in-fill designed to complement the National Register Historic District. Docents from the International Academy of Design and Technology will highlight architectural design elements at each home, and local caterers and restaurateurs will provide a progressive lunch. Antique cars are also making a first-time appearance at the Tour. The New Florida Region Model A Restorers Club of Tampa will display their beautifully restored cars at each home, enhancing the historic-period ambiance.Day-of-event tickets are available at Kate Jackson Park for $25. Advance-sale tickets are $20 through www.HistoricHomeTours.com or from selected local merchants throughout Tampa. The Tour begins at Kate Jackson Park, with homes open from 10:00 a.m. to 2:00 p.m.We are delighted to be a part of this great event and look forward to spending a day amid the lovely tree-lined streets of Hyde Park. Please stop bye and say hello while you enjoy your tour!